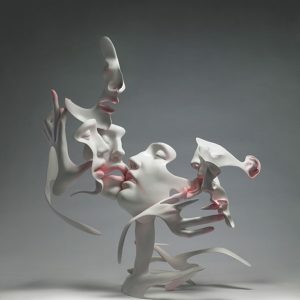 Unmask Group is an artistic trio composed of Beijing-based artists Liu Zhan, born in 1976, Kuang Jun, 1976, and Tan Tianwei, 1978. Three boys met while they were studying at the sculpture department of China Central Academy of Fine Arts and have been producing sculptural work together since 2001. 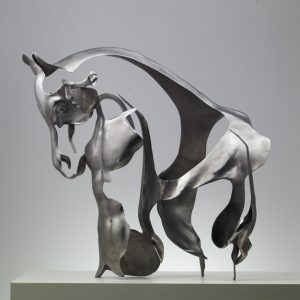 The Unmask art group is known for their seemingly incomplete figures in a state of dissolution out of stainless steel and marble. The almost-abstract figures leave just enough of the sculpture intact to make the solid figure clear. It’s the exclusion of certain parts that add a hint of intrigue. Most of their work revolves around self-image as a central theme, challenging one’s self-awareness with contemporary opinions. Using the language of sculpture, they create new ideas and philosophy of art, and present new vision and aesthetics. Unmask is an art group consisting of three artists, who have different perspectives of art, but who feed off each other, debate and make concessions until a unique logic is accepted by all of them. It makes them different from other artists as they place greater emphasis on individuality and coexistence, which are the foundation of their cooperation. This also allows for greater flexibility when implementing an artistic process and enables all of them to exert their specific talents. The human form, including both the body and its social status, is the key element of their artworks. 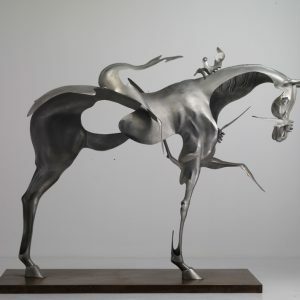 Influenced by their research into classical Chinese and Western sculpture but at the same time striving for their vision of the “human”, Unmask group started to conceive every human as a mini universe. 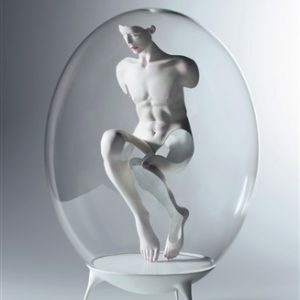 In their Transparency Series, in 2006, trio used their own body characteristics to create human forms like classical sculpture and then purposely deleted the redundant parts, including gender and ethnic identity, by removing the defects of the sculpture in a two-dimensional way. Finally they got some varied and fragile bodies with internal and external parts that corresponded to each other. Putting these bodies randomly in a certain space formed an environment which was unbalanced, delicate and highly unexpected. In their “0° Degree Series” humanoid creatures gather in a void space, forming an isolated and virtual ecosystem, surrounded by a shell that shapes the panorama but is also a way of creating self-protection. The self-containing space is isolated from, if not contradictory to the outside world, forming an independent and virtual environment.